Home / Revolution / A View from the Fort: In The Middle Of The Table Or A Perpetual Muddle? A View from the Fort: In The Middle Of The Table Or A Perpetual Muddle? Mid-season; In The Middle Of The Table Or A Perpetual Muddle? Plus an interview with Juan Toja. With a quite possibly dry (no beer) and certainly hot (July weather) home match against the Quakes marking the middle of the Revolution’s 2013 season, practically all the demarcations for assessment of the team’s accomplishments fluctuate wildly up and down with wins, followed by losses and draws, yet always returning to the same place, a bit below the middle of the league standings, and well shy of post-season qualification. Certainly, there is no question that a combination of interesting newcomers, combined with settled and sometimes surging veterans, make this team interestingly full of potential. And, of course, there are others who clearly have ability, but have yet to significantly impose their talents in this particular campaign, like Jerry Bengston, Kalifa Cisse, and even Andy Dorman and A.J. Soares. Certainly, with such potential in the wings, as well as the now remotely possible return of Kevin Alston from his health-bound exile, you certainly have a team that doesn’t lack for talent. What would Stevie Nicol have done with this bunch? Hard to say, truth is there are now only nine players (out of twenty-nine) remaining from the pre-Heaps years and one of them is a returnee (Dorman) and the other that grizzled veteran, Diego Fagundez. So over two-thirds of the groceries have been bought by the new administration. That said, in a further invocation of Parcellsian terminology, you are what you are, and what the New England Revolution are now is a team that hasn’t been in the mix for much of anything since 2008 – five years ago – and on present form, isn’t going to finish in a position to do much damage this year either. This hurts, probably more in the mid to long-term than in the present, discouraging as present form might be, having seen a bad start followed by a promising May and early June put paid to by poor results in the last few matches. Truth is, despite the present inconsistencies players like Juan Agudelo, Diego Fagundez, Andrew Farrell and Kelyn Rowe are pretty consistently being bandied about as eventually headed for bigger, greener pastures. And then there are rumors that Cisse and Sene are also being headhunted from other shores, offering the prospect of the currently promising squad being cherry-picked in advance of ever attaining anything in the way of accomplishment. When a team does badly or underachieves the old sporting saw goes, “You can’t fire the players,” so the gaffer gets the chop, a new boy comes in, shakes things up a bit with maybe a good result or two but soon, all too soon things are back to where they were before the axe fell. However, in football, the intensity of European free market opportunism can strip a line-up peopled by players of promise thereby turning a team into a bunch of no-hope plodders with the opening of the transfer window. Make no mistake, the chomping cicadas in Connecticut are indulging in a light lunch when compared to the avaricious appetites of agents, to say nothing of those who they represent when they get a whiff of percolating possible paydays on foreign shores. And given the frankly penurious salaries offered stateside, it is impossible to argue the case. Michael Parkhurst played for four years for F.C. Nordsjælland in the Danish first division in front of screaming 6,000 souls per match over the past few years. He just transferred to F.C. Augsberg (recently promoted to Bundesliga 1) with an increase of 80% to just under 30K pushing through the turnstiles. Yet, since 2007 this player was willing to perform for less than 50% of the crowds he would get at ultra-suburban Gillette Stadium. Why? Well salary for one, but also opportunity for advancement through Champions League, etc. Even though it is becoming clear that Big Five aside (England, Germany, France, Italy and Spain), the U.S. first division offers equal competition on the pitch until MLS generally and the Revvies specifically can offer equal opportunity in the pay packet well, sooner or later, bye-bye to the likes Agudelo, Fagundez, Farrell and Rowe and any others for whom the pastures beyond the Foxboro artificial cow pies seem greener. Heeding Stewart’s wise words, the burden going forward rests almost completely on the shoulders of Coach Jay Heaps and General Manager Michael Burns. The former needs to strategically evolve and grow in the immediate short term in order to take full advantage of the differing and diverse talents of his charges. The latter has to tussle with a phalanx of greedy representatives, the suenos and ambitions of the athletes, the sheer obtuseness of MLS’s salary rules, as well as the ownership’s seeming lack of fiscal flexibility to try a preserve some semblance of the current playing staff together. Somehow, some way, there needs to be significant long term contracts reckoned, offered and signed so that when bigger sharks and bottom feeders enter the pool to pursue their prey, they will at least have to fork over healthy amounts of cash at the checkout line. And there will need to be new, talented guppies in the pipeline ready to replace the departed. 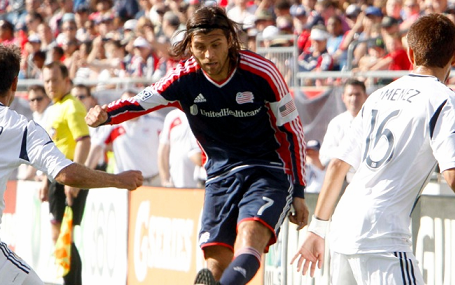 If that sort of cycle can be achieved, then there can be considerable hope that multiple maturation from both players and coaches alike will allow the Revs to evolve into a formidable MLS force. Otherwise, perhaps the new boy on the basketball block, Brad Stevens, will be pounding beers with the no longer inexperienced and totally hoops savvy soccer supremo Jay Heaps with both equally mourning the vagaries of their conditions of hire. JIM: I’m really interested in hearing your observations comparing football here to the other teams and places that you have played, such as Colombia, Argentina, here in the States with Dallas as well as in Greece and Romania, plus your background. For example, was it your uncle or your grandfather that was a well-known footballer in Uruguay? JUAN: Both of my grandfathers played (professionally), one of them is Uruguayan and he played for Penarol back in the 1950’s…also his brother he played professional soccer and my grandfather moved to Colombia to play for Independiente Medellin and Cucuta (Deportivo) and he fell in love with my grandmother and he stayed in Colombia. That is from my father’s part (of the family). And my grandpa from my mother’s (side), he’s Colombian, he played for Santa Fe and Millionarios (and) one of the teams I played for, Santa Fe of Bogota and he also played for the national team…all of them they played professional soccer so let’s say that I have it in my blood. All my family follows soccer, my father tried to play professionally but he couldn’t and, well, I grew up watching soccer, in our country soccer is the first sport so everybody plays it. JIM: And when you were a little kid, of course you had the great national team of Carlos Valderrama, Leonel Alvarez and all those wonderful players; did you grow up idolizing them? JUAN: Yes, I still do, they are still my idols, players like Valderrama, Aspirilla, Rincon. When I was young, it was our best team in our history and it was one of the best teams (ever), the best team in that period. Unfortunately, they didn’t win the World Cup, they didn’t but it was a great team and their style was a motivation for all of us Colombian young players to grow up playing and watching those guys. JIM: Nowadays people with short memories say that Barcelona and Spain invented the “tiki-taka” passing style but, in fact, that Colombian team of the 1990’s invented the quick passing style. JUAN: Yeah, it was one of those teams in the past (that) played incredible soccer like, let’s say, Brazil in the 70’s, Maradona with Argentina, this Barcelona (team) is amazing and they changed something too, but those (Colombian) teams, they always will be remembered. JIM: I remember when the World Cup was here in Foxboro and the States in 1994, and that Colombian team came and played a friendly before the tournament and by that time I had been following football in England, Germany and Argentina for 15 years and just watching them move the ball so fast, I’d never seen anything like that. JUAN: Yeah, that team, I told you, it was amazing… I think they played, like 30 exhibition games before the World Cup and they won all of them, all of them, they didn’t lose any of them and then unfortunately in the World Cup some things happened and we were unlucky also. JUAN: Exactly, for us it was the first (time) we felt (together) as Colombians, (with that) national team. The national anthem, our music, our food, for sure but when the national team is playing it is something. JIM: As a friend of mine says there are 32 departamentos (states) in Colombia, and there are thirty-two Colombias. JIM: What was it like for you to go to Argentina as a young guy and play in the River Plate system? What was different? JUAN: It was a dream. I grew up watching Argentine soccer which is one of the best in South America and also in the world and River Plate is one of the biggest teams in South America and also in the world, so when I got that chance I was very young, I was 19, 20 years old, now that I look at those years, I was a baby, I thought I was big but now that I am older and I see that I was just a child. It was a great experience and I was living a dream, literally, I was living my dream playing for one of the biggest teams in South America, being so young. I learned a lot, I didn’t play as much as I wished but I learned a lot, I played with very big players, I had the chance to play, it was a great experience. JIM: Jose Goncalves says that he learned defending when he played in Italy – where was it that you played that you really learned your game, or as you say, became a mature player? JIM: Did you play truco when you were there, the Argentine card game with no rules where everything is bluffing? JUAN: (laughing) No, I didn’t. I didn’t have the chance but I think one of the best places that I have been was Argentina because I was (so) young and I had the chance to learn so much with very big coaches, very big players. I learned to be focused on the game, to work hard every day, not to give anything to anybody, to fight for my position. It was one of the places (where) I learned the most. JIM: Was Enzo Francescoli still at River as a coach or player when you were there? JUAN: No he wasn’t, he was already retired, I think, yeah, I’m old but not that much…(again, laughing). JIM: No, no, I understand, so what player or players would you say you pattern yourself after, in your style of playing? JIM: Excuse me, but I see in those players you have mentioned I see that is the style that you play, you go from box to box, you play back, you go forward, there are both offensive and defensive elements to your game, all those players that you mention, well, maybe not Ronaldinho, are what in the States you would call a two-way player. Is that fair to say? JUAN: (laughing) Yes, and also I love to go forward and dribbling and (to use) some skills and make some passes. JUAN: Yes, for one year and a half. JIM: And then you went away to Romania and Greece and now you have come back to MLS. What differences have you noticed in the league? JUAN: Yes, the league is so much bigger. When I was playing in Dallas, there were just 12 or 13 teams, the people weren’t following soccer as much as they do now. Now there are 19, 20 teams, there are like 5 or 6 more teams, every stadium that you go to play they have their own stadium, it is not any more turf, I think that we are only one, two, (maybe) three maximum (that play on turf). (There are) twenty, twenty-five, thirty thousand fans every game. I think the league has grown up so fast and I (think) it will grow more, so I really appreciate that and I really love it because in our league (in Colombia and others), it doesn’t happen. The league already is the league, it is not going to get bigger or smaller, it is just going to stay (as it is). Here, it is getting better and better and you have great chances to play in great cities with great stadiums and very nice atmospheres. JUAN: Yes, it is very, very different; here that pressure doesn’t exist that you have in the other leagues to play (in) the cups like the Champions League or the Copa Libertadoes being in the first positions or if you are in the last positions fighting for not going to the second division. Because nobody (here in MLS) goes to the cups or (at least) they are not as big (here) as (elsewhere) or you don’t go to the second division (here). Sometime(s), you have the feeling there isn’t that pressure that you are going to lose everything, basically everything in your professional life by going to the second division, so it is quite different. JIM: Most of the players who come here from other countries say that the travel here is crazy, going three time zones, like the game you guys played on Saturday against Chivas USA. How do you, or can you adjust? JUAN: Exactly, for us (there) a long flight is one hour, (after) one hour and a half the guys are already fighting each other because it is too long when you travel to play those games in different cities. Here, one hour doesn’t exist in any travelling. JUAN: Yeah, that’s just driving to practice and coming back, right? So here, every time (you make) a trip is three, four, five, six hours, it is very tiring. JIM: And the heat, now if the Revolution guys complain I imagine you would say, “Hey, you could be in Dallas,” but how do you possibly adjust to the heat? JIM: Really anywhere, because for the next two months of the season most games will be in very warm weather. JIM: But in Colombia, the players all know that and they all know to slow the game down. But you watch here, half the players are running like crazy, and then they drop dead later in the game. JUAN: Yeah, it is hard, New England isn’t (so) much because it isn’t that warm as other places. But (when) I played in Dallas, playing there in that stadium that is also below ground in the Inferno, I experienced that (sort of heat) just in Greece (as well), just in Greece and Dallas, (those are) the places where I have played that are the warmest. It is very, very difficult, but the thing is, you just get used to it, you know for you guys, normally every time in the winter there is no (problem but) for Colombians, we just want to kill ourselves, you know? So, it is just being used to it and practicing these days (when it is hot) and you just get through it and then (to) be ready for the game. JIM: One of the things that is very attractive about this team is that even though we are in New England the team has taken on a Latin American flavor with you and Agudelo, Bengston and Diego and even the some of the gringos are playing Latin style. Does this come from you guys specifically, or from the coaching approach tactically? JUAN: I think that for me, the best thing is to have players from everywhere with different backgrounds, different races, everything because everybody gives something different to the game, to the practice, to the atmosphere, so having French guys, having South Americans, having Americans, Europeans, South Americans, North Americans, I think it is a great mix because everybody has something different that they can give to the team, so I love it and I think we are showing that in this last period. We play the ball, we like to play but when we have to fight, we fight, we play long balls, we play balls through, yeah, a little bit of everything. I think is the best combination. JIM: And maybe it is the signature of this league, this mixture, wouldn’t you say? JUAN: Exactly, like now I don’t know how many South Americans, Latin Americans are in the league, Europeans are coming and coming and coming and the Americans, the North Americans every time they have more and more very good players, so the league is improving in every way, so I basically love it. Great interview Jim! Good to hear Mr. Toja’s thoughts.